Old buldings in Baia Mare. Baia Mare, the county seat of Maramureş, is in the western part of the county, at the foot of Igniş Mountains. As the biggest and most important urban, economic and cultural centre of Maramureş, Baia Mare has a population of approximately 138,000 inhabitants (in 2002). The city is situated at an average altitude of 230 m, and is crossed from east to west by Săsar, a tributary of Lăpuş River. Baia Mare’s old town centres on Piaţa Libertăţii. Many gothic and baroque constructions are found around the square, among them the remarkable house of Iancu de Hunedoara. 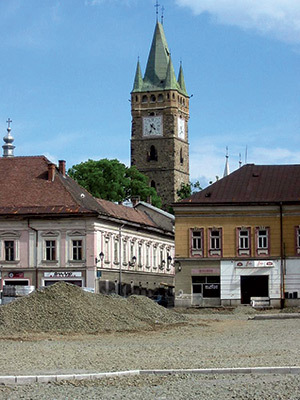 The Tower of Stephen is the most representative mediaeval building of Baia Mare. It was built between 1446 and 1468 at the initiative of Iancu de Hunedoara as a bell tower for the Cathedral of St. Stephen that was later destroyed in a fire and no longer exists. The Tower of Stephen from Baia Mare. The House of Iancu de Hunedoara, also called Elisabeta House, is a thick-walled building, the oldest civilian construction in the city. It was built in the mid-15th century by Iancu for his wife Elisabeta. Butchers’ Tower (Turnul Măcelarilor), also called Butchers’ Bastion, or the Ammunition Tower, was built in the 15th century as part of the old fortifications of the mediaeval town. It is situated in the Piaţa Izvoarelor. The Mint Bastion (Bastionul Monetăriei), together with the Butcher’s Tower, is one of the few remains of the old fortifications of the town. One of the most beautiful parts of the town is the park on Dealul Florilor (Hill of the Flowers) where the Monument of the Romanian Soldier, work of Andrei Ostap, honours those who died fighting Hitler in the Second World War. The Maramureş County Museum, with its headquarters in the Mint Bastion on Strada Monetăriei, was officially opened in 1904. The Museum of Archaeology and History (Strada Monetăriei) has valuable collections of ceramics, various objects made of bronze, silver, gold, stone and bone, coins and bank-notes, weapons, clocks, documents, photographs, etc. They mostly illustrate the history of the Baia Mare area, and especially its past as an important mining centre. 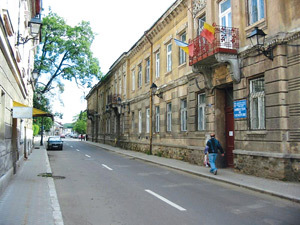 The Museum of Ethnography and Popular Art is located in the building of the former Summer Theatre (Strada Dealul Florilor). 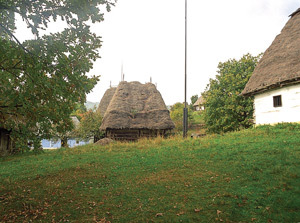 A house from the Village Museum towards Baia Mare. The Ethnographic section continues at The Village Museum. Situated in the beautiful landscape of Dealul Florilor, it covers about 12 ha. The Art Museum, with more than 3,300 works of art, is located in an 18th century building near the old centre of the city (Strada 1 Mai). Within the Maramureş County Museum functions also the Planetarium of Baia Mare, the oldest one in Romania. It was inaugurated in 1969 and has presented ever since the stars in the sky, giving an astronomy lesson to all interested. The Museum of Mineralogy of Baia Mare is the biggest museum of its kind in Europe. The town of Seini is situated near the border with Satu Mare County, 26 km west of Baia Mare via the E58 or taking the train. Seini is considered to be one of the main wine producers in the area, and nearby there is an andesite quarry. 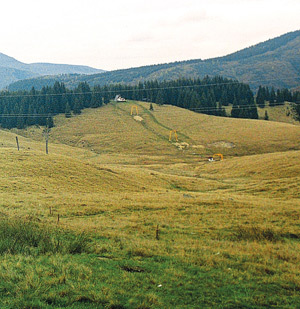 On Comja (Comşa) Hill, north of the town, there is a unique living monument: Pădurea cu pini (Forest of Pine Trees), a 0.5 ha protected area. 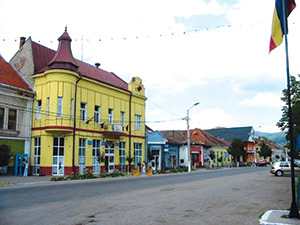 Baia Sprie is an old town about ten km east of Baia Mare taking the national road DN 18 that leads on to Gutâi Pass and Sighetu Marmaţiei. The most interesting places to see are found in the old centre of the town, around Piaţa Libertăţii, where 18th-19th century architecture can be admired. Mention should be made of the baroque style House of the Jesuits, built in 1739, where the town hall is now; the old Directorate of Mines, which dates back to 1733; the wooden house of Samuel Csaszi, built in 1754; and the oldest masonry church in town, the church of the Assumption of the Holy Virgin, built in 1793. Cavnic is a small town with about 5,000 inhabitants at the foot of the Gutâi Mountains in an extremely scenic valley. Cavnic is an important name in the history of mining in Maramureş. There are two ski locations built in the last years: Roata with five slopes of different difficulties, all with a ski lift, and La Icoană with three slopes with a ski lift and a slope for tobogganing. 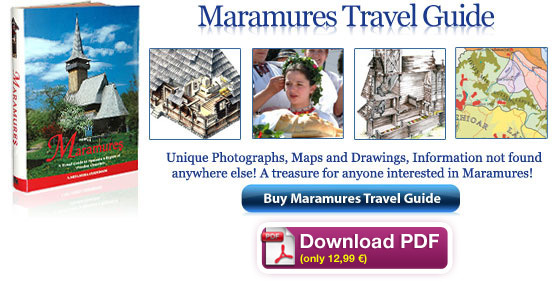 Besides the nature and the winter sports, there are some other attractions in Cavnic. Stâlpul Tătarilor (Tatar’s Pillar) is a 7.2 m high monument. From the ethnographical point of view Cavnic preserves a series of customs and traditions that are specific to this town only, and are not to be found elsewhere in Maramureş. One of these is called Constantinii, a sketch played during the winter holidays in the memory of Constantin Brâncoveanu. 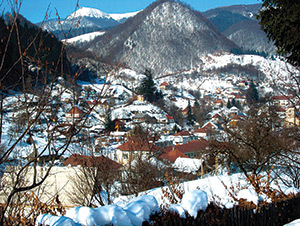 Izvoare Resort is the most important ski resort in the Ignis Mountains. The Igniş and Gutâi Mountains are probably the most visited mountains in Maramureş. Gutâi Pass (987 m) separates the two massifs, leaving Igniş with Igniş Peak (1,307 m) to the west, and Gutâi with Gutâi Peak (1,443 m) to the east. These mountains have impressive volcanic landscapes, remains of craters and high plateaux, which are protected by several natural reservations. Situated at the foot of Igniş Peak, Izvoare Resort is the most important ski resort in the Igniş Mountains. There are dozens of swamps in the Igniş-Gutâi Mountains, formed on plateaux or in small depressions. They are the habitat of numerous rare species of plants. The natural reserve of Lake Albastru (or Blue Lake) is three km north of Baia Sprie, on the Minei Hill. The natural reserve of Cheile Tătarului (The Tatar Gorges) is a hydro-geological reserve in the valleys of the rivers Brazi and Runcu in the eastern Igniş Mountains. Close to the town of Baia Sprie, at the foot of Igniş Peak (1,307 m) there is the famous reserve of Chiuzbaia. It is one of the richest and best preserved sites of Pliocene fossils in Romania. 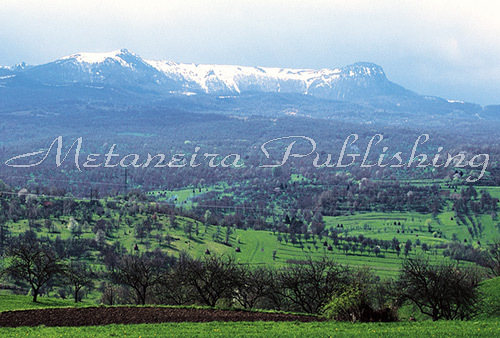 Creasta Cocoşului (50 ha) in the northern Gutâi Mountains is the most visited volcanic mountain chain in Maramureş. It is about 200 m long, and the highest point reaches 1,395 m.
Much higher than the neighbouring Igniş-Gutâi, the Lăpuş-Ţibleş Moun-tains are however less visited. The reserve protects rare species of plants that can be found only here. On the southern foothills is the Peştera cu oase or Cave with Bones reserve. In the cave were discovered fossilized skeletons of the cave bear (Ursus spelaeus), that became extinct at the end of the last ice age, about 10,000 years ago. Here there is another important cave that has been declared a protected natural area, the Ponorul Jitelor Cave. With its 1,050 m of length, it is the longest sandstone cave in Romania, and the tenth longest in the world.